Keeping in mind the diverse requirements of our clients, we are engaged in offering a wide range of Stretch Marks Reduction Cream. 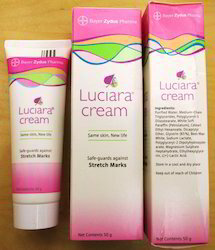 This Stretch Marks Reduction Cream is highly effective to removes the testacy marks from skin. After regular and longer use this Stretch Marks Reduction Cream makes the skin smooth and fine. Backed by a team of professionals, we are engaged in offering optimum quality range of Melanil Cream for Pregnancy Strech Marks to our clients at market leading prices. This is stringently processed by our experts using excellent quality ingredients and advanced processing techniques. Pregnacream Cream is a topical cream can be best use to remove stretch marks, Pregnacream provides the pure extract of Aloe Vera and prevents stretch marks during and after pregnancy. - Safe for both, mother and child. Our company is a well known company that offers a quality range of Kumkumadi Cream. Mistine Cream Regu Demo-peel Active Whitening Helps brightening underarm, groin area. Lightens dark spot while removing dead skin cell gradually within 4 weeks. High quality natural and botanical ingredients have been carefully blended and specially formulated with skin lightening agents and multivitamin.